OBDii Auto Code Reader Scanner. VW Audi Group/VAG Code Reader. Heavy Duty Vehicle Code Reader. 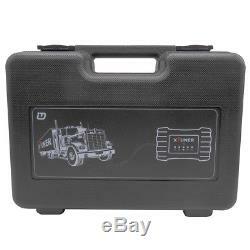 Professional HD Heavy Duty Diesel Truck Diagnostic Scanner Code Reader Scan Tool. Supporting more than 22 languages: including Arabic, Czech, German, Dutch, English, Finnish, French, Hungarian, Indonesian, Italian, Japanese, Korean, Polish, Portuguese, Romanian, Russian, Swedish,ish, Bosnian, Thai, Turkish and Vietnamese. 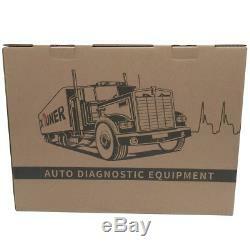 XTUNER T1 heavy-duty truck scanner Features. Extensive vehicle coverage for heavy-duty trucks. Complete function capability including DTC, DTC freeze Info, Live data, Actuation test and Special function. Support standard protocol J1939, J1708 and J1587. Supply USB and WIFI connection for the VCI. New software update on the internet. 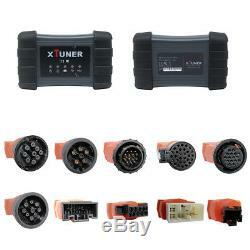 Supply OBDII and other 10 connector. Hardware architecture uses a new design with multiple protection, interference and stability. Built-in overvoltage protection module is applied, in order to protect VCI and vehicle against accidental damage during checking. Can work well and stably in high and low temperature environment. The genuine Windows XP/7/8/10 operating systems allows for more stable performances, better compatibility and expandability. Extremely easy-to-use with touch-screen operation and intuitive operation in the windows. Read ECU Info, Read DTCs, Erase DTCs, Clear learning value, Data Stream, Actuations, Read freeze frame data, Read/Write VIN, Basic Reset, Control unit adaptations, Air bleeding, Level calibration, Oil change, Idle speed learning, Idle speed Adjustment, Camshaft timing control learning, Broken cylinder test, Dpr Manual Forced Regeneration, Injector Codes, etc. DPF ResetNozzle Or InjectorFuel Pump, Exhaust Pressure Adjustment, EGR, ECM, Vehicle Speed CONTROL, Cylinder, VIN, Write Engine Serial Number, Turbo Control. ABS(anti-lock brake system), After treatment system, Airbag, Airconditioning system, ATA Anti-theft alarm system, ATA(Auxiliary heating system air-to-air), AUS(Audio system), Behr independent air-conditioning system, BMS(Brake Management System), Body control system, Bosch DENOX AdBlue System, Break control system, BWS(Preparation system), CCS(Climate control system), CLS/ATA central locking system with anti-theft alarm, Comfort/assistance/safety systems, Compressed Air Reserve system, CSS(Collision safety system), CTS(Clock and Time System), EBS(Brake System), EBS(Electronically Controlled Brake System), Electrohydraulic steering system(EHLA), EMS(Engine Management System), Engine management system, Engine System, FLA Flame starting system, GMS(Gearbox Control System), Instrumentation System, Lane departure alarm system, LAS(Lock and alarm system), LGS(Lane Guard System), MAN Marine Diagnostic System(MMDS), Meritor Wabco Brake System, MTS Modular door control system, RAS-EC1 steering system, Security System, SRS Supplemental restraint system, Suspension System, Torque converter and clutch system, TPM(Tires pressure Monitoring System), Transport Information System, Vehicle control system, Vehicle elctrical system power converter, VIS(Visibility System), VRDU Driver assistance system, WS Maintenance System, WTA(Auxiliary heating system water-to-air), ZVA Central locking system, etc. 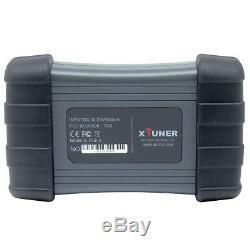 XTUNER T1: ALL software are free to use. All software are free to update within 1 years from the date of product activation. Heavy Duty Brands Professional Software. Brands software functions are advanced, support FULL systems. I only listed ALLISON, ASTRA, Bendix, Benz, HINO and Hyundai vehicles' models. I did not list other brands vehicles' models. We frequently update the software to support more new models. If you need, you may send us message for details. ALLISON: Transmission 1000 Series, 2000 Series, 3000 Series, 4000 Series, T Series, Off-highway Series. ASTRA: ADT, HD7, HD8, Military vehicle. Bendix: 6 & 9 DEUTSCH Interface. BENZ: Actros, Actros(963), Actros(964), ATEGO, AXOR, BR300, BR400, CAPACITY, CITO, CONECTO 0345, CTIARO, ECONIC, ECONIC(956), INTEGERO, INTOURO, O345 CONECTO, OC500, S315, TOURISMO 0403, TRAVEGO, 0350 TOURISMO 0403. F: FORD, FOTON, FREIGHTLINER, FUSO. HINO: 700 Series-Global, 700 Series-Euro, 700 Series-Japan, 600 Series-North America, 500 Series-Global, 500 Series-Japan, 300 Series-Global, 300 Series-Japan, 300 Series-North America, BUS-Coach Heavy-Japan, BUS-Coach Medium-Japan, BUS-Coach Light-Japan. HYUNDAI: Light-VAN, Medium truck, Heavy Duty Goods Vehicles, Light BUS, Medium BUS, Large BUS. Electronic control system: BENDIX, CUMMINS. XTUNER T1 Software Running Environment. Hardware requirements: laptop, PC and PAD with Wi-Fi or Bluetooth. Space of system disk can't less than 5G, and RAM can't less than 1G. Operating Systems: Supporting WINDOWS XPWIONDOWS 10, but not WINDOWS RT. Network requirements: The software needs to be activated & downloaded online, so please make sure your internet is connected. 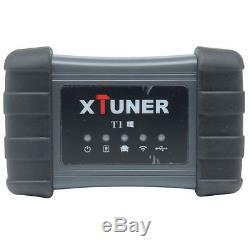 XTUNER T1 support both USB and WIFI connection for the VCI, provide you great convenient in diagnosing Heavy duty trucks. 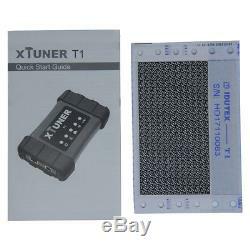 1PC x XTUNER T1 VCI. 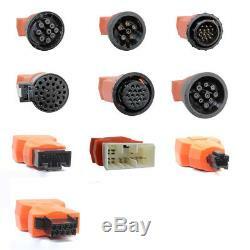 1PC x Main Test Cable with OBDII connector. 1PC x for BENS-14 Connector. 1PC x for CAT-9 Connector. 1PC x for DENSO-12 Connector. 1PC x for ISUZU-9 Connector. 1PC x for ISUZU-20 Connector. 1PC x for IVECO-30 Connector. 1PC x for VOLVO-8 Connector. 1PC x Cigar Lighter Cable. 1PC x Quick Start Guide. All packages will be sent out within 24 hours. Customers' satisfaction is our top priority. That is why a friendly return is possible here. Please give us a chance to resolve any problems arising from business. 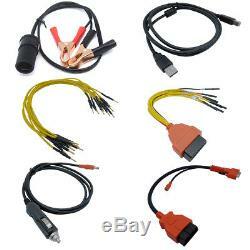 We are one of the suppliers of professional diagnostic tools, equipment and related accessories, etc. Since foundation, we have been committed to creating maximum long-term value to customers worldwide by providing quality-assured, easy-to-use, cost-effective and innovative products. All the products are manufactured in accordance with the strictest standards to meet international quality and environment standards, including FCC, CE and RoHS. We are always here to answer your questions, please allow us to respond to your message within 24hours because of time difference. Then it will save your precious time to find us next time. 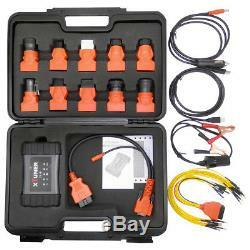 --- More than 30 Heavy Duty Vehicles Brands are supported by this professional diagnostic tool. The item "Professional HD Heavy Duty Diesel Truck Diagnostic Scanner Code Reader Scan Tool" is in sale since Saturday, June 3, 2017. 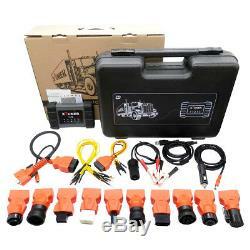 This item is in the category "eBay Motors\Automotive Tools & Supplies\Diagnostic Service Tools\Code Readers & Scanners". The seller is "elitop_shop" and is located in Hong Kong. This item can be shipped worldwide.